Maintaining positive thrift karma is indispensable when you're on the hunt for fabulous finds -- especially the ones that cost absolutely nothing at all. Even as we shop for vintage and thrift, if we take the time to learn the stories behind the objects that call our name, aren't overly greedy about swooping up everything in our sight and sincerely engage the vendors who are offering these enchanting objects for our delight, we are creating lots of good vibes that the thrift gods won't ignore. Take for instance the incredibly talented Mick Jordan from Everyone Goes To Mick's. He's the guy I told you about a while back who, by himself, refurbished his Diversion Lake, Texas, cabin and transformed it into the Casablanca Hotel and Resort, complete with its own drive-in movie theater. He told me the story of how he frequents an incredible antique shop in Wichita Falls called The Antique Wood, where he purchased his 1954 stove at a really sweet price. He always makes it a point to take his friends to this treasure-trove-of-a-find, since its quality of merchandise is difficult to match. And of course, Mick's not the kind of guy who shops somewhere looking for freebies (Now that would be an example of BAD thrift karma! ), but he was awfully surprised when they were recently offered -- twice! "The last two times I have gone into [Glenda Tate's] shop, she has 'gifted' me things," Mick told me." The first Gift of Thrift that she gave Mick was a vintage, shell-back lawn chair that he had been "circling like a shark." He said he was taken off guard, but happily took the shell-backed chair home and painted it pink to please a young lady. Then not long ago, he ventured back to his favorite shopping spot and was caught off-guard once again. "We were chatting about things we both collect, and I mentioned that I was on a chalkware kick. All of a sudden her eyes lit up, and she said. 'Well I've got something I'm going to give you.'" She then produced a tiny chalkware dog that she handed to Mick. "I call him Spot, and just like that, he was mine," Mick says. Creating good thrift karma goes both ways: the shop owner solidified her relationship with a loyal customer, and Mick took home a small token of her appreciation, reminding him of all the amazing goodies for sale at her shop. Now if you look closely at the photo Mick sent me of his new pet, you might notice that Spot is resting atop an old vinyl recording of "Where Has My Little Dog Gone?" I think I know where he is! Fabulous & Frugal Fun: Sharpen Up! 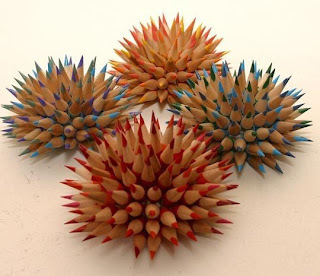 Creative minds can take the most mundane, everyday objects and cast them in a vision that is pure fantasy. I know I've been talking a lot about the set designer and interior decorator extraordinaire Tony Duquette lately and the way he was able to junk as common as plastic salad tossers, straps from rubber sandals or pieces of a broken purse and turn them into glorious, revered pieces of decorative art. 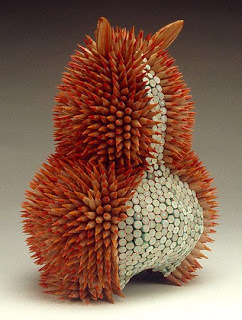 The same revisionary skills have also been granted to artist Jennifer Maestre who takes colored pencil nubs and fashions them into quirky creatures, such as this one that she calls Imp. Her fine art is on display at her website here. But you can also purchase one of these prickly penciled sea creatures on her Etsy shop here. Or if you feel like wearing one of these colorful creations, she also offers earrings, cufflinks and heart-shaped pendants. The sculptures run $125, but each is custom-made by the artist herself. As I gazed into the masterful windows of New York's emporium of good taste, ABC Carpet & Home, I took note of a scenario that looked like it could have been included in my book The Find: The Housing Works Book of Decorating With Thrift Shop Treasures, Flea Market Objects, and Vintage Details. Even though the clear glass and metal tones project a sense of unity, you'll notice when you look closely that hardly anything comes from the same set. Among the flatware there's one tiny fork with a mother-of-pearl handle among designs that range from positively Victorian to artistically contemporary. Why I bet toward the right side, there might even be a piece of stainless steel! A mix-and-match set of silverware creates an element of surprise every time you set your table. It's fun to look at the indications that mark each piece, divining where it might have traveled or what happened to the rest of its set mates These shiny old utensils might have traveled on an old cruise ship or resided in a long-gone hotel. Or they may have been placed at a grand table many decades ago. No matter where they've spent their past lives, when these mismatched pieces are brought together, they excite the eye and bring a sophisticated taste of history forward. Sublime Sundays: Tune in tomorrow! 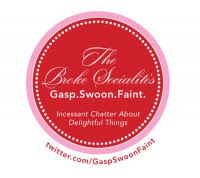 I'll be chatting up a storm tomorrow, Monday, January 25, at 7 p.m. with The Broke Socialite on her fabulous radio show Gasp. Swoon. Faint. You know I love to talk about The Gift of Thrift. I'm certain that tomorrow I'll be showing off my Gift of Gab! See you (or hear me!?) tomorrow! Set your web radio dials for 7 p.m. on Monday, January 25, when I'll be chatting with The Broke Socialite on her fabulous radio show Gasp. Swoon. Faint. Now doesn't that just sound like me? Call in and say hi. Just follow the link for what is certain to be a gab-fest of fun! The Gift of Thrift: But is it? 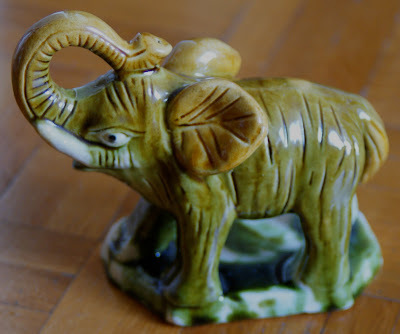 No sooner had he explained in Croatian what I said in English than Klaudija leaps up, snatches the elephant from his post and says," You want it? I don't. My mother gave it to me, and I don't like it." Well, then, I have to admit, I felt a tiny bit embarrassed. Was she saying this because she felt I wanted this little elephant so badly? Or did she truly want to get rid of it and was just waiting for the right person to upon which to unload it? I'm pretty certain that she really wanted me to have this handmade elephant, and I could envision his living a content life with his planter brother on my windowsill.So after making sure that she really wanted to give it to me, I happily took it even though I wondered if her mom would ever notice that the elephant she gave her daughter had wandered off. This story roughly transitions into something I want to experiment with for Fridays going forward. I can't tell you the amount of really good stuff that I find for absolutely free, either sitting in the garbage or lying, yes lying, on the sidewalk. And since Fridays are supposed to preface the wind-down to the weekend, I'm going to loosen up a bit myself and start posting either "The Gift of Thrift" or "Free Fridays." If you'd like to send me your picture of a free find that you picked up, just email it to me at theelegantthrifter.com and tell me your story. I'll happily consider if for "Free Fridays," and you'll make The Elegant Thrifter's workload just a little lighter! If you're looking to give a naughty-but-nice gift, perfect for Valentine's Day, Mother's Day or any other special occasion, check out Ingrid, my hot-to trot new Hooch Bags at Hooch Bags by The Elegant Thrifter. She's waiting, and available! If you're like me, you love a good sale. But if you're even more like me these days, your shopping, too, has been relegated to the window-gazing genre -- one that leaves a very thin wallet unopened. Those eye-opening experiences do have their rewards, though. Take this sale sign made out of old magazine pages, for example, that I spotted in my neighborhood. I know you've seen this kind of crafty work before, but I admire the way its creator took a certain effort in choosing color-coordinated pages and strategically placing them in ways that call for further inspections. Why, do I see a collection of Mardi Gras beads sprinkled in there between the "S" and the "A" ? A woman in a white bikini with someone who looks like Mel Gibson and a guy doing a Michael Jackson dance in the "A?" A cowboy hiding out in the letter "L?" Or a pair of blue sneaks dangling inside the "E?" Despite the advertised low prices, I didn't even enter the shop, let alone make a purchase. However, I can say that I most certainly enjoyed the sale. One of the best things about New York is that you don't have to spend a dime or go very far to be entertained. Whether it's a movie crew set up in the street, a fabulous find just lying on the curb or a whacky person putting on a show in the middle of traffic, oh yes, I've seen them all. So yesterday morning while walking down Broadway, I passed the New York University Steinhardt School's windows only to be entertained by the repurposed art of Jennifer Gustavson. Read more about her here. Now whose interest wouldn't be piqued by an installation called, "Great Black Hornet's Nest Underneath my Kitchen Table." But it was this lightbulb dangling over a chunk of amber wax that nabbed my eye. I love the way the bulb slowly melts the block with out a flame and creates a small puddle at its base. As I walked on over to the next window, I was greeted by two thrift-store end tables placed back-to-back, holding a piece of plywood underneath a sort of "clothes line" draped with an array of everyday objects: a spackling bucket, a saw, a vinyl totebag. I'm particularly attracted the two wine glasses balanced base to base, thereby creating a new shape once put together. I'm not sure exactly what is confined in the bottom glass, but the creation is imaginative. Just as in decorating a home with repurporsed and found objects, it's always refreshing to me when people use everyday objects and turn them into a real work of art. If you're looking for more decorating eye candy, stroll over to Design*Sponge and read its fabulous review of The Find: The Housing Works Book of Decorating With Thrift Shop Treasures, Flea Market Objects, and Vintage Details. The Find: Happy Birthday Dolly! Today is Dolly Parton's birthday. And if I could spend one day with a famous person, well, it would definitely be Dolly. I'm inspired by her rags-to-riches story, her acute business sense and her true entertainer's love for making people happy. A couple of years ago, I threw a party I called Dolly-Rama to celebrate the release of Dolly's "Backwoods Barbie" album. 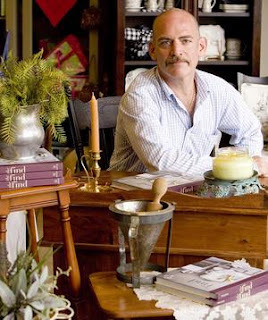 I was just starting the editing process of my book The Find: The Housing Works Book of Decorating With Thrift Shop Treasures, Flea Market Objects, and Vintage Details and was primed with ideas for throwing a get-together that would make my muse proud. I wanted a distinctive tabletop, so I first tapped into the 1970s and found a heartwarming motif in Dolly’s song, “Coat of Many Colors.” My mom and I started out by gathering scraps of pastel gingham and butterfly prints, cutting them out in randomly sized squares and sewing them together for what resulted in our “Tablecloth of Many Colors,” paying homage to Dolly’s classic. From there, everything else seemed to fall in place. 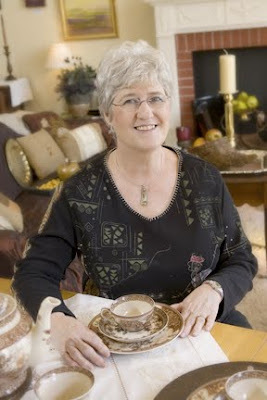 Three vintage gold-trimmed pieces of china I bought for a few dollars at Lutecia Clementine’s in Independence, Missouri, easily mixed into my own white dining plates for a touch of Grandma chic. I further expanded on the homespun tabletop with an old metal picnic basket I found at a thrift store in Memphis. I loaded it up with fried chicken and corn pone, which is something I’d never tasted before but found the recipe in the Dollywood cookbook. I found mix-and-match napkins for a few dollars at Housing Works in New York and at Kansas City’s River Market Antique Mall. Some already had butterflies on them, but for the one’s that didn’t, I ironed on appliqués of the fluttery creatures. For unique decorations, I rummaged through my own collection of Dolly souvenirs that has consistently grown over the years. The large cutout standing behind the table came from one of Dolly's book promotion. I keep it stashed behind the headboard in my bedroom to make a surprise appearance when people gather in my home. The small cutout above the table is another promotion from the early ‘80s touting Dolly’s album, "Nine To Five…And Odd Jobs." I also made a Dolly-Rama banner that I decorated with appliqué butterflies and stick-on rhinestones. I hung it from the ceiling above my buffet table. And for party favors, I made a playlist of my favorite Dolly songs, burned them to a CD, and offered them to departing guests. We sang Dolly songs, drank “Jolenes” (a shaken concoction of RC Cola, Vodka and a splash of lemonade), and nibbled pink, butterfly-decorated cupcakes and sugar cookies until the wee hours of the morning. The only thing missing was our singing diva in the flesh. But I think she was there... at least in spirit. I thought of all of the beloved images in my book The Find: The Housing Works Book of Decorating With Thrift Shop Treasures, Flea Market Objects, and Vintage Details, the pictures of me with Dolly Parton (Her birthday is tomorrow! ), some funny Christmas shots and snaps with family and friends who no longer walk the earth. But then this photo glided into my thoughts. I had no trouble locating it because I think of it often and keep it in a safe place. In fact, it came to mind a couple of weeks ago as I watched Dad swinging my two-year-old nephew in his arms and singing him to sleep. Taken in 1967, this photo shows my sister and me atop our rocking horses with dad trying to get us to go to sleep. As you can see, my sister is conked out, but I'm still awake. I love my dad's striped pajama legs and just imagine that he was having a dickens of a time getting us to nod off. And isn't my dad handsome? I certainly wish I had hair like his now. I do cherish this photo even though I don't recall it being taken. I do, however, remember our rocking horses and my father's loving touch that was always so present. Dim the lights, serve up a warming drink and sit for a spell. That's what went through my mind the other day as I was visiting The Rural Modernist and spied this collection of lighting made out of old beverage containers. 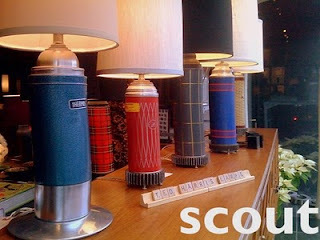 Crafted by Chicago artist Ted Harris, these beverage beauties were on display at the amazing urban antiques shop, Scout. Harris is known for taking other people's cast offs, such as old globes and masses of discarded light bulbs, and turning them into fabulous lighting structures. read about him in the New York Times here. I can just imagine what Harris might be able to do with all these assorted vessels nestled atop my kitchen cabinets. There's my childhood cookie jar -- the one that my mom put in a box and mailed to my door in New York a few years ago; a metal Calvin Klein pitcher from my fashion days; and a Japanese looking vase that a friend once offered flowers in. And there's my thermos! It once belonged to a neighbor's husband who carried it to work every day. It's too tall for the space between the cabinets and the ceiling, so I set the cup on the cookie jar next to it. My parents bought the beverage carrie at her garage sale because it seemed to be labeled just for me. 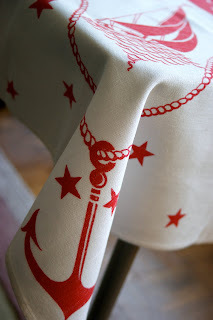 Fabulous & Frugal Fun: On Deck! We all know that things are just things and stuff is stuff, but sometimes objects continue to haunt us long after we've offered them as a Gift of Thrift, shipped them off to a loving, new home or even left them in the spot where we spied them. Such was the case when when I bumped into this odd object at Kansas City's River Market Antique Mall while on a thrift hunt with Bob Greenspan, who photographed more than one-third of The Find: The Housing Works Book of Decorating With Thrift Shop Treasures, Flea Market Objects, and Vintage Details. I was initially spooked by this slinky, heart-shaped picture frame that appeared to be made out of snakeskin and was perched upon a glass display counter surrounded with gilttery, costume jewelry. As I slipped in for closer inspection, I realized that the entire piece was crafted from tiny pieces of Camel cigarette wrappers, woven together just as a child would have done to make a chewing gum-wrapper chain. This intricate example of handiwork is what some people call prison art, an object created by someone behind bars who used whatever he could get his hands on to make this specimen of beauty for a special someone. Having grown up in the Midwest with winters packed with ice and snow, I welcome neither the cold weather nor the nasty stuff that comes with it. So on glacial days like today, I conjure up images of long summer days filled with sunlight that end in a glorious setting like this one that took place last year over the Long Island Sound. Oh summer days, how I miss you and eagerly await your return. Last summer while doing events in the Kansas City-Independence, Missouri, area for The Find: The Housing Works Book of Decorating With Thrift Shop Treasures, Flea Market Objects, and Vintage Details, I joked that I was thrown in thousands of driveways when the Independence Examiner ran a front-page story about the book accompanied by this huge picture. Well, they're at it again. Now I doubt I made the cover this morning, but once again Adrianne DeWeese, a reporter at my hometown newspaper, wrote a fantastic story about how to get comfortable with shopping in thrift stores. Click here to read the story. And yes, I once again talk about sniffing your potential purchase for offensive odors! Do you always do that? I know I do! Always Frugal, Always Fabulous (sniff, sniff)! The Gift of Thrift: A Shell of a Deal! 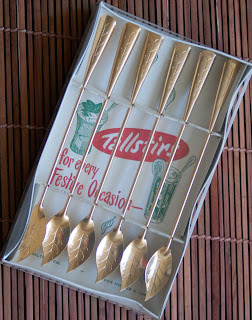 I love it when I am able to offer a thrifty gift where the recipient finds difficulty in realizing its lowly origins. 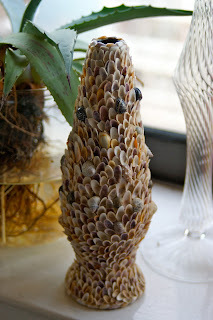 This intricate shell encrusted vase was found for next to nothing at the Fort Lauderdale Faith Farms Thrift Store. In exquisite condition, the bivalve shells are carefully placed to create balance and harmony on this textural treasure. Have you guessed what it once was? I myself wasn't sure until I tipped my budget-friendly find over to discover that it had once been a beer bottle. Here's another photo of an innovative bulletin board I snapped while doing research for The Find: The Housing Works Book of Decorating With Thrift Shop Treasures, Flea Market Objects, and Vintage Details. This handsome eye catcher (somewhat hidden by the pile of art books and magazines) is made of upholstery materials once sat in the foyer of fashion designer John Bartlett and master framer John Esty's former apartment that was featured in The Find. 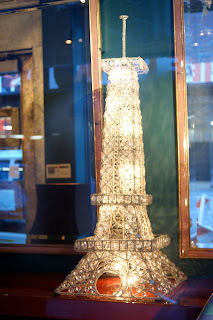 It was crafted out of woven strips of jute chair webbing that crisscrosses in a weathered metal frame. The structure is elegantly illuminated by an articulating lighting fixture that's attached for added interest and usage. I couldn't help but take a picture of this vintage nut cracker -- one that looks like my dad paid $4.49 somewhere. It was made by the Arthur R. Reed Manufacturing Co., in Little Rock, Arkansas, and newer versions of this device are still on-sale today. I've never seen my dad use this machine, but I'm certain he does, since he's not they kind of guy to hold on to things he doesn't use. It looks like a pretty serious contraption, so he must have had a major nut-cracking job to complete. Based on its looks, I imagine that this "ruggedly built" gadget would make a loud blast when cracking a shell and then propel its contents into the next county! And then, for some reason, the words to a song that in a bizarre way match match another tune came into my head: "Nutcracker, Nutcracker, crack me a nut...."
One of my favorite photos from The Find: The Housing Works book of Decorating With Thrift Shop Treasures, Flea Market Objects, and Vintage Details is of a tin tray holding a collection of rusty skeleton keys discovered at the Alameda Point Antiques and Collectibles Faire. 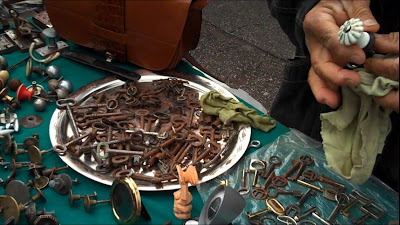 Today, the platter of of keys I'm sharing are ones I found in November at Britanski Trg's flea market in Zagreb, Croatia, demonstrating that wherever you go in the vintage and thrift world, you'll always find the familiar at the most unexpected moment. On another note: Remember the amazing Christmas fiesta I shared with you last week? Check out here a gallery of more photos of fabulosity by one if the party guests. She was here. Oh yes, it's true. 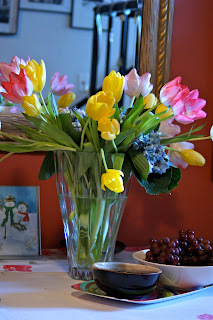 LeAnn Stephenson, The Vintage Laundress, and her delightful family dropped by my New York apartment Saturday for a mini-brunch, bringing with her a magnificent bouquet of spring flowers, perfect for boosting my frigid spirits on a glacial winter afternoon. You know, LeAnn is the first of my blogging pals to have stopped in for a visit. So you can imagine that I was a bit nervous at her seeing my home in person after having spent nearly a week in her beautiful abode while promoting The Find: The Housing Works Book of Decorating With Thrift Shop Treasures, Flea Market Objects, and Vintage Details at the Round Top market last fall. I pulled out my favorite printed tablecloth found at a thrift store in my hometown of Independence, Missouri; made a run to Whole Foods for mini-scones, muffins and coconut macaroons; and pulled out my 1970s wooden mushroom tray from J.C. Penney for serving up some cheese and crackers. I was in such a fun frenzy before my guests' arrival and so intent on catching up during our short visit that I forgot to take pictures. But Leann really was here. I promise. And maybe she'll share with me some of the photographic evidence once she returns to Austin. The Gift of Thrift: Happy New Year! I'm always amazed when someone throws what all say is a fantastic event or travels to an exotic corner of the world and there are no photos! No photos? For me, photos of beloved places, people and creations -- especially when they are easily accessed digitally -- are comforting and inspirational. They bring me closer to loved ones far away, remind me of my accomplishments and instantly take me on a world tour to all the places I love. A photo, other than a heartwarming memory, is probably the least expensive souvenir one can take home and keep forever. But isn't it funny how we think we remember a situation and then look at a photo and realize an extra person in the group or a strange item poised oddly in the frame? I always try to have a camera with me at all times since it never fails that I fall upon a perfect photo op when I don't have one of my digital cameras (I have two: a tiny one that slips in my pocket and a larger SLR type) in my possession. I love touring the world from my sofa as the snow falls outside my window. I visit my family in Independence, Missouri; dear friends in Croatia and California; and jet off to my favorite destination on the planet: Paris. Don't let this photo fool you: I'm in New York City today. But as I project on the new year that has arrived, I remind myself of the places that always inspire and revive, the people with whom I never seem to spend enough time, and all the new ideas, fun projects and fabulous adventures that I am open to receive....and share.